Discussion in 'Bonus Spins - Extra Spins - No Deposit Bonuses' started by Kotsy, Dec 1, 2013. Christmas season is in high gear at Redbet Casino!! To celebrate, they have an Advent Calendar with some great surprises for you. Each day, you can click on the star depicted in the Christmas scene and see what is in store. The player who makes the highest win with this one free spin gets an iPad Mini! Ok the one Free Spin is now credited. Today 3 December 2013 at Redbet Casino releasing the brand new video slot Creature from the Black Lagoon. What can you win at Redbet today? 10 Lucky winners can win €50 each in bonus money by playing Creature from the Black Lagoon. Behind number 4 from the Redbet Casino advent Calendar we have found a 50% match bonus. Get free cash with the monthly casino reload - 50% up to €50. You'll need to make a min deposit of €20. I have opened this morning number 5 from the Advent Calendar at Redbet Casino. The following promotion was in. Today you can join the Redbet GrandSlam tournament with a prize pool of $500. Plus the winner of the GrandSlam tournament will win an Red iPod Shuffle! The GrandSlam tournament will be played on the Redbet Ongame software at 19:45 CET and has a buy-in of just $5. Get 50% bonus up to €50 during the weekend. Make a deposit of €20 in the Casino Red and Redbet give you 50 free spins on the newest NetEnt Video Slot Creature from the Black Lagoon. Today at Redbet Casino - IPAD MINI TOURNAMENT. The player with the highest net earnings of 20 consecutive rounds gets an iPad Mini! Position 2,3,4 and 5 will get €200, €100, €50 and €25 in bonus money. and about and are randomly choosing 10 Lucky players to win €50 each. 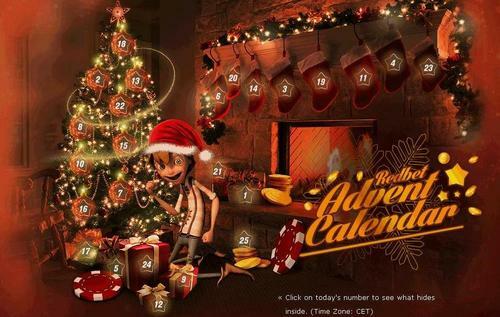 December 12th, you can get today at Redbet Casino 50 Free Spins! Deposit at least €25 to Casino Red and you'll get 50 free spins on Twin Spin! What a great Bonus. I live this TwinSpin Slot. Thank you for sharing. Get a 30% Bonus at Redbet Casino! Open the advent calender for more details. 2X $150 Poker Tournaments at Redbet Casino. Every Saturday on Redbet Ongame Redbet Poker run two Push'em tournaments with $50 added to each tournament and a buy-in of just $1. Today instead of adding $50 they will be adding $150 to each tournament! Redbet Casino is giving all players a 20% Reload Bonus! will win some great bonus money. But, if you're playing at Casino Red, you may win something special. 5 players will be picked at random throughout the day for a €50 prize.